Magerealm is expanding its Skill Crystal system by adding 2 additional skill crystal slots! 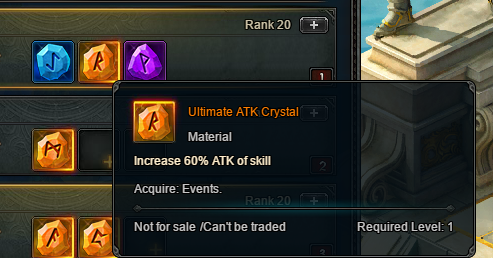 Customize your skills even further with Skill Crystal 2.0! The recent update has expanded skill crystal slots from 1 to 3 so players can have more choice in how they can empower their skills. In this article we will go over some details that players might find confusing with the new system. First, players cannot place more than 1 crystal of the same quality together. This means you can put a Purple ATK Crystal with an Orange ATK crystal together and they will both work, but NOT 2 Orange ATK Crystals together. 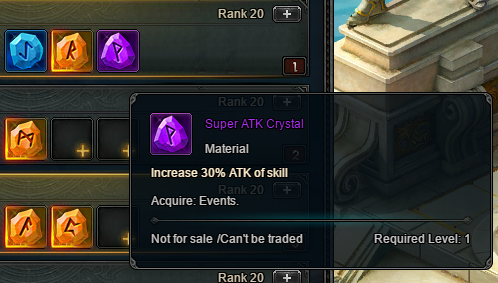 You can have crystals of the same stat as long as they are different quality. Also crystal cooldowns are shared between skills. For example if you had an Orange Rejuvenation Crystal if both the 3rd and 5th skills, using one of those skills will trigger Rejuvenation’s 20s cooldown in both skills. Using the other skill will not trigger the effect until the cooldown is over. We hope you have gained a better understanding of how Skill Crystal 2.0 works, and we are excited to see how players will use it to their advantage. Log in to Magerealm to see more details and follow Magerealm on Facebook and visit the official forums to get the latest news and participate in rewarding events. Come play one of the best browser action MMORPG’s for free!